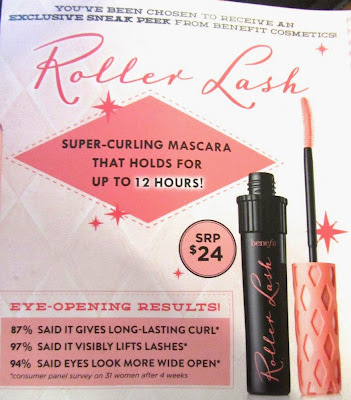 This sample size Benefit Roller Lash mascara was a freebie with my recent Sephora.com order. 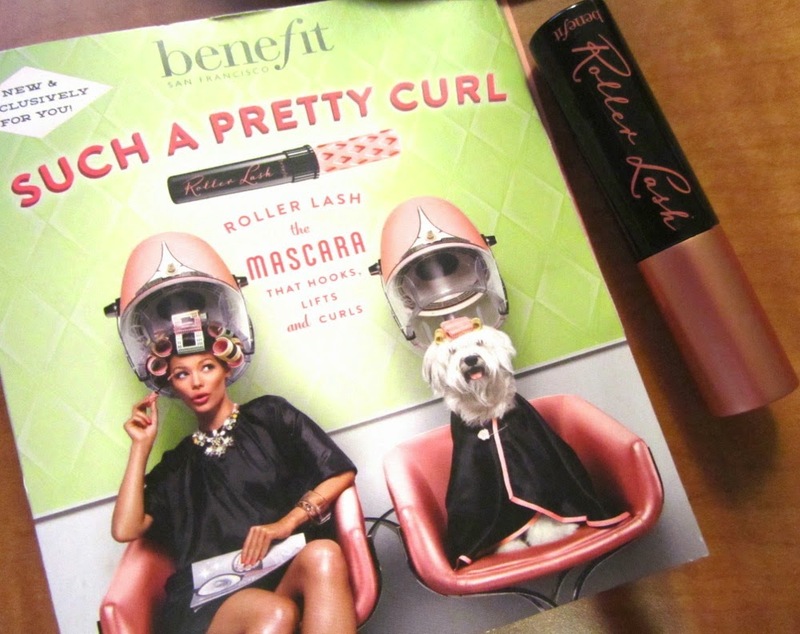 When I first read about Roller Lash and its "hook'n'roll" brush that supposedly catches, lifts and curls the lashes thus doing away with the need for an eyelash curler, I put it down to Benefit's usual over-the-top marketing tactics. 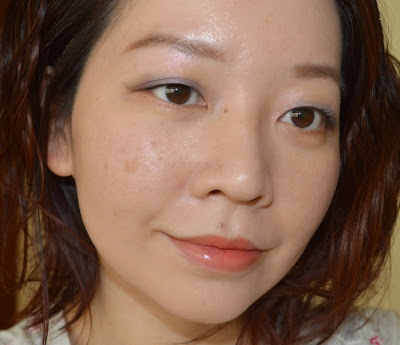 While their bestselling They're Real mascara (earlier review here) did work well for me, the claims for Roller Lash seemed too good to be true, especially when it comes to stubbornly straight and weak Asian lashes. The slightly curved brush has a row of shorter bristles on one side, which is not that revolutionary. 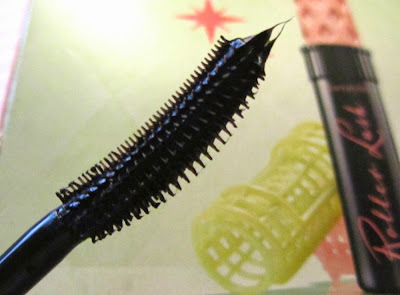 The mascara formula strikes a good balance between not being too stiff/gunky and not being too wet/gloopy. After testing this out for a week, I have to say that I'm truly impressed at its lifting power. I've used this several times without curling my lashes in advance, and each time, Roller Lash adds noticeable curl to my lashes and lifts them up from their usual downward pointing position. Both looks below were done without using an eyelash curler. With its jet black formula, Roller Lash provides good definition, lengthening and volumising effects, although it does start to clump if over-layered. I also liked how easy it was to use on my extremely sparse lower lashes. My lashes stayed curled for the whole day without any flaking or smearing. It was easy to remove with my current Neutrogena eye makeup remover, although there was one incident in which five lashes came off on the cotton pad and caused a minor panic. I haven't noticed any other lash loss since then, so it could just be a one-off thing. Overall, I'm still sufficiently impressed to consider purchasing this once my sample dries up although I probably will not as I still have a massive stash of mascara samples to work my way through. Like virtually any mascara, this generates a serious division of views as reflected in the MakeupAlley reviews so your mileage may vary (but that is pretty much the case for any cosmetic product). What I'm much less impressed by are the trio of palettes released by Suqqu for Spring 2015, which I ordered from Selfridges. These looked so beautiful in the pan with glorious shimmer but when applied, the color payoff of some shades is completely sub-par. Take for example, the periwinkle blue in #19 Awafujisukashi which pretty much fades to a muddy, washed out grey, regardless of the base. #18 Sakuraori is the best of the lot but its orange shade can be a tad hard to pull off. EX25 Haruhinata was also disappointing in its sheer level of pigmentation. Both Wondegondigo and Color Me Loud have more positive reviews of the quads, if you're considering them. Sara of Color Me Loud has also posted swatches of the new summer trios on Instagram and they look really promising. Below is a second look done with Awafujisukashi. 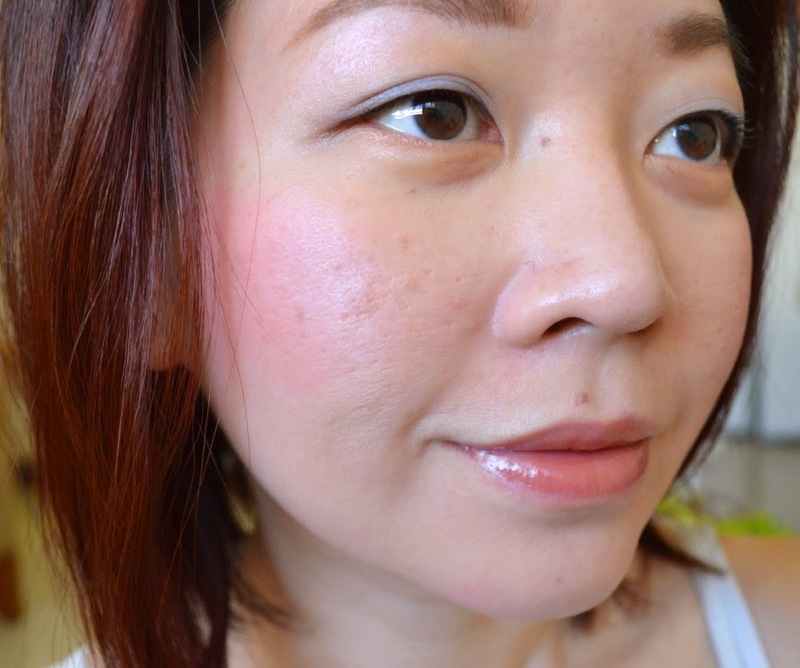 For this look, I'm also wearing Ellis Faas Skin Veil S102, which has received rave reviews from some of my favourite bloggers. I received samples of this in four shades with my last B-Glowing order (another e-tailer that I highly recommend). I can see why this is so beloved, as it blends effortlessly, with good coverage and does not show up dry patches or look mask-like. This is the first FOTD post I've done in over a year, so I hope it's helpful! I would like to resume posting product reviews but can't promise that I can do so with any regularity. We've been in Illinois for about a month now, but we are going home for the summer and then moving to another apartment after we return here. I'm looking forward to finally settling into a more permanent (and nicer) place, and getting all of my stuff out of boxes. Right now, I'm mainly focusing on using up stuff, burning through all my candles (which have gone around the world with me only to end up back in the country that they originated from), taking Lush baths every other day and also trashing all the products that have expired. I should do a no-buy but that never lasts for long. For me, the sample worked better than the full size. My lashes are short and angle down, so I always use a lash curler. I was sorta happy with the sample, but the full size takes the curl right out and has my lashes pointing down again. Also tried this over lash primer, and still had the same problems. 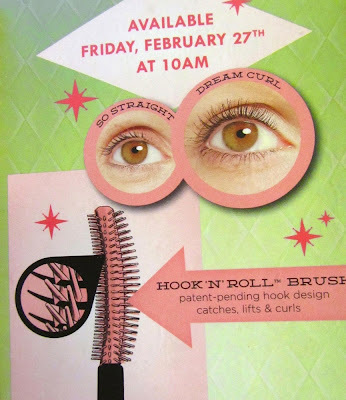 Still looking for a decent mascara that will at least hold the curl I've already placed. Last one was a discontinued L'Oreal. Just used up my last tube and am stuck. This one had me hopeful, but didn't work. Thanks for the review and sorry for the whine. I've heard of that strange problem before, when the sample works better than the full size! Not sure why, but sad to hear that the full size of this did not work for you. Benefit was giving away this sample mascara in the UK with Glamour magazine, but it was completely sold out everywhere when I was there in March, otherwise I would have snapped up a bucketload. Thanks for the kind comment and hope your Charles is having lots of fun and adventures in the US! I'm quite happily settled over here. The weather's been fantastic, so we've been having many fun afternoons in the parks. I definitely need to work on greater restraint in terms of shopping and not being such a product junkie.